The mission of Habitat for Humanity is to eliminate substandard housing and homelessness worldwide and to make affordable shelter a matter of conscience and action. The goal is to work with people in partnership everywhere to develop communities for God's people in need.
. Home in Ernest was completed and dedicated in August 2018. ATTENTION: This years Jackie Kallal Yellow Creek Triathlon will be held June 8th , 2019 and will be a Duathlon(no swim). Please see and download a brochure on this website. **** We do not have a Restore , and will not accept any items at this time! PLEASE DO NOT CALL FOR A RENTAL PROPERTY OR A HOUSE TO MOVE INTO. WE DON'T HAVE ANY. ALSO REMEMBER YOU DO HAVE TO WORK 500 HOURS ON A HOME AND PAY US A MORTGAGE, IT IS NOT FREE!!! Project completed at 145 Store Hill Road in Ernest, Pa.
You have to work on a home , and pay for it . It's not free! We also do not remodel other persons homes! 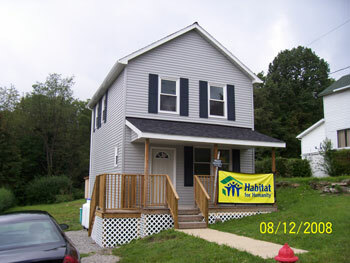 © Habitat For Humanity Indiana County, All Rights Reserved.